Presently owned by a family in the North Okanogan, BC, the owners feel it should be 'out in public', and are offering it For Sale. ​Recently fully refurbished by Laurie and Teddy. $ 45,000.00 CDN. Contact Us for more information. 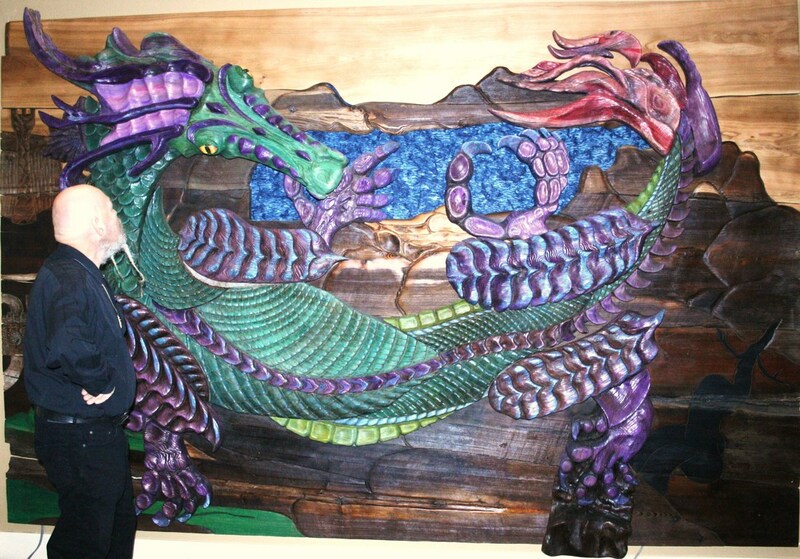 See Past Projects for more indoor and outdoor murals. Over the years, we have begun or made many square feet of mural, which has never been used. Should your design have fields of grass, small animals, totem poles, and long houses, we may have a good part of your mural already waiting for you! Contact Us! Door Panels can be commissioned in any size. We are not carpenters. You can supply us with an appropriate door for carving; or we can supply large panels (cants) of red cedar, and your carpenter can make it into a door, or into a panel for a door. 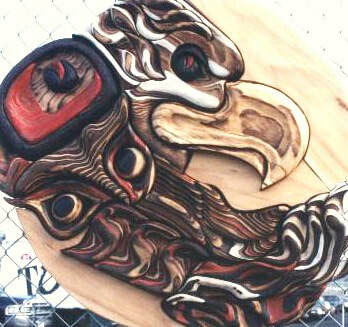 Also, we can create a stand alone piece, which can be attached to your wood or metal door. Obviously, prices will vary; a single piece of red cedar, 7' tall x width of the wood, with a simple design - $ 3,000 - $ 5,000. In the collection of the high school in 100 Mile House. 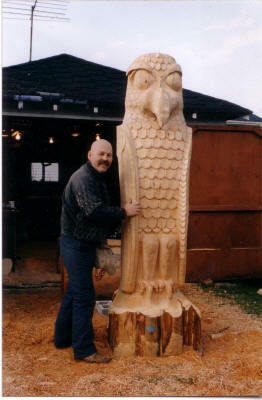 Teddy and the custom Falcon Pole for Echo Valley Guest Ranch, near Clinton, BC. The Guest Ranch raises Gyr Falcons. Native Poles or Purlin ends are $ 2,000/ lineal foot of pole. 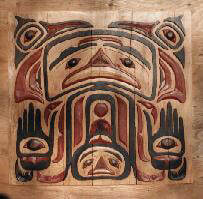 Bentwood Box designs are very complex and time consuming, both in the design and the execution of the carving. 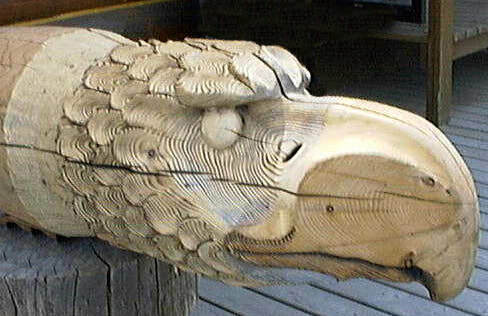 Art pieces are quoted according to size, amount of carving, and complexity of carving and finishing. 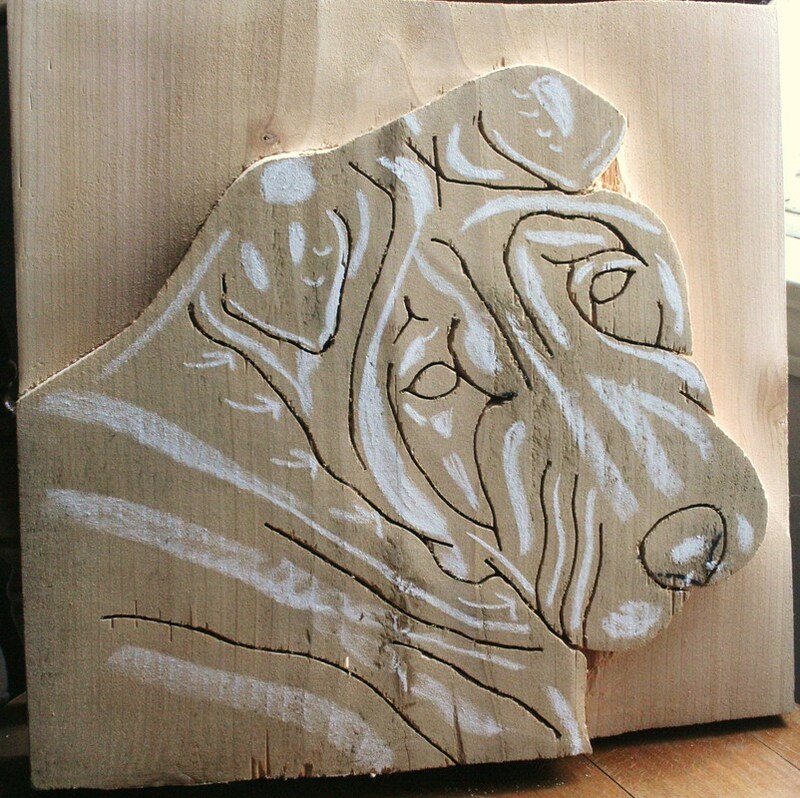 This small dog portrait of Zaza the Shar Pei was fun to do.